The size of the radiators you will need depends on the size of your room, the quality of your insulation and several other factors. For standard sized rooms you can use our radiator calculator to work out the total wattage required. However, if your room has a ceiling height of over 2.7m you will need a higher wattage than the calculator recommends because you will be heating a large volume of air. We recommend speaking to our sales team for an expert heating consultation if your rooms are over 2.7m tall. Our friendly sales team will draw up a personalised heating plan for your property and give you a quote totally free of charge. We’re here to help, with practical advice from down-to-earth professionals. Why are larger rooms and rooms with high ceilings difficult to heat? 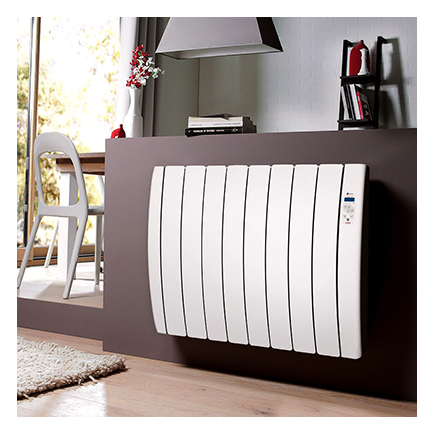 Our radiators heat using a combination of radiated and convected heat. Radiation works by heating the people in the room directly; as the surface of the radiator heats up, it pushes out heat into the room. Radiated heat is effective no matter what the size of the room – however, radiated heat only makes up about two thirds of the radiator’s heat output. Convected heat, meanwhile, works by filling rooms with warm air. As cool air circulates around the room it is warmed by the hot elements inside the radiator. Because hot air rises, the warmer air will rise to the ceiling, allowing the remaining cooler air to circulate through the radiator and warm up in turn. The problem with heating by convection is that the warmed air can easily be lost through draughts and opened doors. The poorer your insulation, the faster your room will lose heat and the more powerful your radiators will need to be to keep the warm air topped up. In larger rooms and rooms with high ceilings you are effectively trying to heat a larger volume of air than in standard sized rooms, so you will need more powerful radiators to keep the entire space filled with warm air. How do your radiators heat rooms with high ceilings? Our specially designed electric radiators use powerful heating elements to combat the challenge presented by high ceilinged spaces with their excellent heat retention and heat projection properties. Our Haverland Inerzia Electric Radiators use lightweight ceramic stones to store heat and push it out at high intensity. 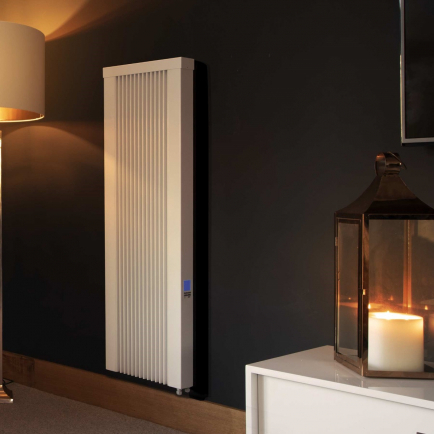 The radiators take a little longer to heat up than aluminium or thermal fluid radiators but then the excellent heat retention properties of the stones keep the heat going for longer without the radiator having to work hard to keep them warm – providing an energy efficient and cost effective heating solution. Whilst some radiators heat mostly through convection, Haverland Inerzia radiators provide a heating output of 25% convection and 75% radiation – so much less heat is wasted heating the ceiling! 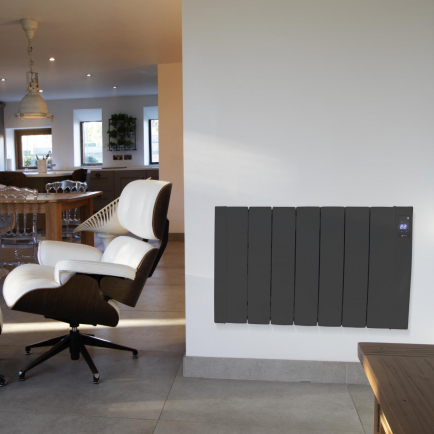 The stones throw out heat at a greater intensity than that achievable by other forms of electric radiator, ensuring that radiated heat reaches into every corner of your large, open plan or high ceilinged room. How high is a “high ceiling”? We recommend investigating electric radiators for rooms with high ceilings if your rooms are over 2.7m high. How do you install radiators for large rooms? Electric radiators for large rooms can be installed in just the same way as radiators for standard sized rooms: you do not need to fit them higher up on the wall – indeed, they will function most effectively if mounted just above floor level as with standard radiators. All our radiators for rooms with high ceilings are suitable for DIY wall-mounting. All you have to do is screw the radiators to the wall and plug them into the nearest socket – it couldn’t be easier. Alternatively if you want a more discrete fitting with no plugs or visible wires, the radiators can be hardwired into the wall by a qualified electrician. 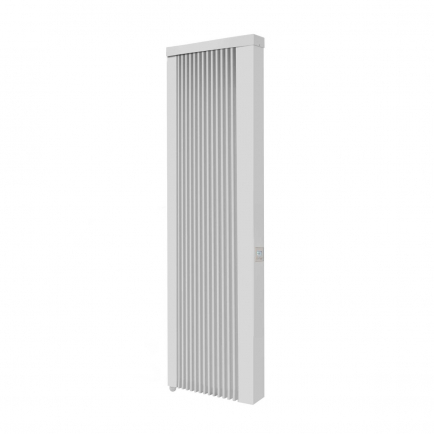 Our range of electric radiators for large rooms and rooms with high ceilings are designed to heat these difficult spaces as efficiently as possible, with powerful heat retentive elements and precision heating controls. Our Haverland Inerzia Electric Radiators use lightweight ceramic stones to heat up fast and push heat out into the further corners of high ceilinged rooms. A high precision thermostat and a programmable timer maintain your comfort temperatures without wasting energy. An excellent heating solution for open plan offices, churches, community halls, Victorian terraces and stairwells.